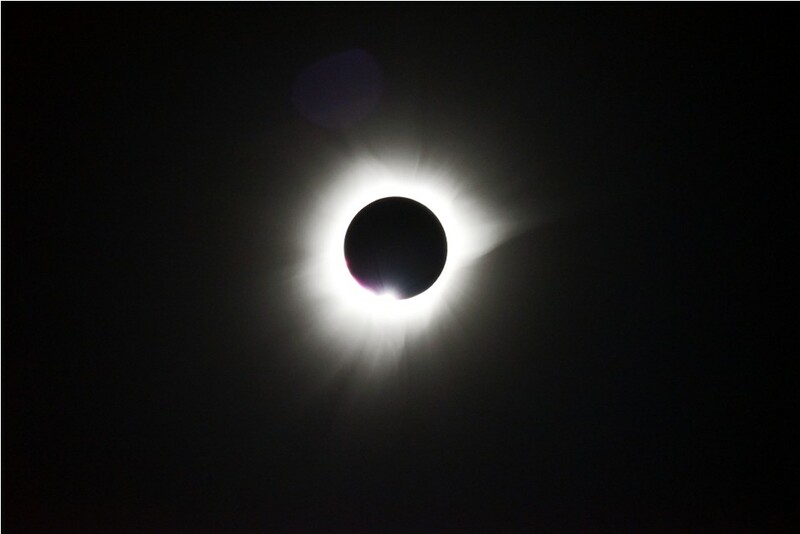 After two years of planning we began our chase to catch the 2016 total solar eclipse which was due to occur in the Makassar Straight in Indonesia March 9th, 2016. Here at latitude 118 degrees east and 2 degrees south of the equator, we hoped to view a total solar eclipse. Our journey began with a flight out of Los Angeles LAX with the FOTO group (Friends of the Griffith Observatory in Los Angeles).We landed in Japan eleven hours later. After a short layover, it was another 7 hours to Singapore where we stopped for a few days before boarding our ship to Indonesia. A long trip by any standards. We spent a few days investigating this magical place of Singapore, where everything seems possible. It is a dream city. The architecture is stellar and breathtaking. We even found Yoda resting in a garden in George Lucas’ design and development building. So that’s where he’s currently hanging out! No graffiti, no litter, the fines are substantial and caning is permitted. Needless to say we were careful with litter. After a lovely (?) breakfast with the orangutans, we finally boarded our ship, the Volendam, a Holland American line and began a nautical trip of over 2,000 miles into Indonesia and the sight of the eclipse. We were transported back into time, to the Spice Islands of Columbus fame. Nutmeg, cloves, ginger, tea, are still top exports. In this place we found a long tradition of trade among Chinese, Arabs, Malaysian, Muslims, Hindu and Buddhists, and indigenous people. Much later the Portuguese and finally the Dutch took over the trade. The Dutch were overthrown after the Japanese left at the end of War II. In central Java we journey to the temple Borobudur, a Buddhist temple from the 8th or 9th centuries, built by the Sailendra Dynasty. The Buddhist reliefs are phenomenal and thanks to the work of UNESCO, this temple has been brought back to life for all to see. In Probolinggo we’ve traveled by bus through hills of volcanic fields on our way to Mt. Bromo, an active volcano. We saw first hand the rice paddies and the hill side terraces of leeks, cabbages, corn and fruits and lunched near the caldron of the volcano. Chasing non-existent whale sharks in the straits and watching butterflies under waterfalls just added to our exploration of Indonesia. I found the weather to be as challenging as the landscape. High humidity mixed with tropical weather heat meant dehydration was a real possibility. We couldn’t drink enough water. One never knows what worlds are waiting to be discovered when chasing an eclipse. 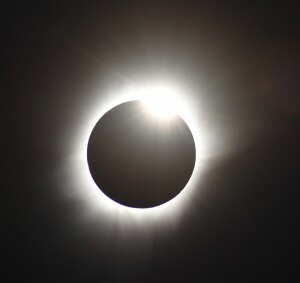 Then on, March 9th, in the Java Sea, we witnessed the total eclipse of the sun (we were given special filters to protect our eyes until the moon completely covered the sun). The temperature dropped almost two degrees and the horizon shaded gray. The air was silent, the event itself, spiritual and mystical. The word creation came to my mind. Then Champagne all around, shouts of celebration and excitement. There are no words to describe the event. Diamond rings, first contact, the sun’s corona, Mercury and Venus shining in the morning light. Overwhelming. Our journey continued and after another day at sea, we walked through a reserve for komodo dragons and walked the temple steps of Bali. Then two days by sea and our return to Singapore. Two days more and we arrived in Los Angeles, making our March 17th day 39 hours long. A great St. Patrick’s Day if one enjoys green beer. So chasing an eclipse? Yes, a real challenge, but worth the uncertainties and difficulties. A raw experience witnessed through the naked eye. Once you’ve been a witness, you won’t be the same. *2017 promises a total solar eclipse through the United Sates. 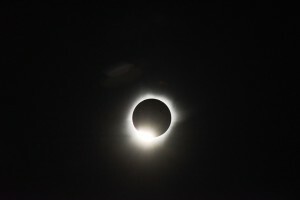 On August 21, the total eclipse of the sun is predicted to begin near Salem, Oregon and end over parts of Tennessee and the Carolinas. Wyoming seems to be the place of choice so far but that depends on how you decide to chase the eclipse.